I’ll never forgot the republic referendum held in Australia in 1999. The polls had looked bad in the weeks leading up to the vote, with the combination of those genuinely in favour of us continuing to be a constitutional monarchy and those unwilling to vote in favour of the specific republican model on offer holding a modest but firm majority but I never lost my optimism. It just seemed too ridiculous that we’d turn down the chance to take the final step of legal independence from Britain. Yes, it’s symbolic, but that’s precisely why it was an important step. And as the day arrived the polls were tightening right on cue. The day of the vote was sunny in Sydney and I had a great time handing out how to vote cards for the Yes campaign. At the time I lived in an electorate that generally voted conservative, being older and wealthier than the average, but it felt clear that the majority were voting the way I wanted that day. The energy from those taking out how to vote cards was very positive and they clearly outnumbered those taking the cards from the No campaigners. We’ve got this! I thought. I was at a party when the results came in. It was relatively early in the evening when the outcome became clear. It wasn’t even that close. We’d lost, 55 to 45, and didn’t carry a single state. I was stunned. Mortified. Outraged. I couldn’t understand how this could have happened. Almost everyone I knew was voting Yes. My family, my friends. Even in the moderately conservative seat of North Sydney the vote had clearly favoured us. How had we lost? How could the rest of Australia have made this appalling error? The emotional hit was worse than anything I’ve experienced after an election. I was confused, angry and sad. And I wasn’t the only one. The mood of the party went sour quickly. Someone admitted to voting No and was set upon (verbally) by a couple of people. More arguments broke out. I wasn’t even in the mood to drown my sorrows or ramble philosophically and so left. It turns out that North Sydney was something like the second highest Yes vote in NSW. And my friends and family were nowhere near representative of the feelings of the population overall. I was living inside a bubble, and was disorientated when it burst. I was reminded of all of this today when I read “Hashtag Feminism” in The Monthly, a review of a recently released collection of feminist writings from the Destroy the Joint organisers called Destroying the Joint: Why Women have to Change the World. The author notes a disjunction between the feeling expressed in the writings that Destroy the Joint had been an establishment-shaking, world-changing movement of real social significance and that fact that she herself had never heard of them before, and nor had anyone she knows. This is what most of politics is like most of the time. We all exist within our bubbles. There is no neutral ground upon which to stand and assess “mainstream opinion.” Those who claim to speak on its behalf rarely resemble the masses they pretend to be one of. But life is an echo chamber. We live in a particular place, surrounded by other people who live in that place. We interact with others in a particular industry or cultural community. We seek out those who share our interests and values. And, yes, social media reflects these general barriers to infinite understanding which exist in human societies. As is so often the case the new thing being discussed, in this instance social media, is being pointed to as a reason for our insularity when in fact it merely reflects it. It takes effort to seek out and understand the viewpoints of those unlike us. Few of us do it enough. It’s easier to consume content I mostly agree with or about things I am already interested in. However in identifying this shortcoming of social media, and of the Destroy the Joint movement, but really of humans in general, it’s easy to miss the real story here. We’ve always been insulated from the full spectrum of human experience and opinion but before social media our isolation could very well be an entirely individual experience. In so many domains people previously believed that they were “the only ones,” whether it was gay kids in the country or women frustrated with the general level of misogyny in our society or someone obsessed with blues in the suburbs. Now for whatever it is is you’re into there’s others like you forming communities online. And yes, deep engagement with a community is perspective-skewing, but so too is watching the commercial TV news each night (you might think, for example, that we are suffering from a crime wave or a weak economy). For those who have become involved in feminist activism as a result of Destroy the Joint I have no doubt the experience has been genuinely world-changing, discovering a community of others who feel strongly about the same issues as them and are prepared to do something about it would be incredible empowering and exciting. Have they won the battle against misogyny in the last nine months? Of course not. But they are active and involved and speaking up and changing lives and inspiring active citizenship and that's actually pretty awesome. This is how it works in a democracy. We find others who care about the things we do and we work together to convince others and affect the changes we feel are needed in our community. And social media has given us a powerful new set of tools to do this convincing and connecting, to learn from and to share our experiences and to support and sustain each other in the long-term effort to create a better future. Image by zzub nik on Flickr made available on a creative commons license. A few months ago a friend from DC, Alex Budak, called me about a social enterprise he was starting called StartSomeGood. The idea, simply put, was to create a crowdfunding (or peerfunding) platform for social change initiatives. He wanted to know if I wanted to be involved in an advisory capacity, helping him design the communications and outreach strategy for the company. I was happy to agree, both because I’m always up for helping a friend and because the idea itself was compelling. While the crowdfunding model has been proved by sites such as Kickstarter and FundBreak these sites are exclusively for creative projects. There is a clear opportunity and a need to provide this service to the social sector. Over the past few months I’ve been working with Alex to refine the vision and product. Over this time I have felt myself get more and more drawn in, and more and more excited about the potential of the project. We have refined our model to make it more distinct and, we think, better adapted for the sector we seek to serve. We realized that success would require more than just advice; Alex needed a collaborator equally-committed to the success of the enterprise. And so I’m really excited to announce that I’m joining as a full co-founder with Alex, and that we should be launching our site next month. There are so many people with ideas for how they want to make a difference in the world, yet they lack the resources that they need to get started. StartSomeGood connects budding social entrepreneurs with the financial and intellectual capital that they need -- all in a fun, engaging and community-driven way. Our site taps into the power of the crowd, allowing social entrepreneurs to ask for small amounts of money from lots of different people - rather than hope for one lump sum. This crowdfunding model is becoming increasingly well-established, especially in the arts, and we believe it is perfect for supporting the launch and development of social change organizations. Over the past 10 years an incredible online fundraising infrastructure has been created for social change organizations. Organizations can fundraise through Facebook and Twitter, supporters can establish their own fundraisers on platforms like Razoo, Global Giving can help you support projects in the developing world from the comfort of home. But almost all the infrastructure that exists has been created exclusively for use by only one type of organization: tax-deductible nonprofits. And we all know that there are many ways to make a difference other than simply establishing a new charity. In all the commentary about the Kickstarter the most overlooked aspect of their success is the fact that they allowed fundraising by unincorporated groups. The two sectors where a huge amount of value is created by unincorporated groups are the creative industries and the social change movement. StartSomeGood will allow any type of group, unincorporated, nonprofit and for profit to find supporters and raise funds for social good projects. Having been part of many grassroots initiatives I know how much good gets created by small teams, formed for discrete projects. We hope to help more people make a difference in their community. Ultimately our goal is to contribute to creating a world where every person has access to the financial, intellectual and relational capital they need to become changemakers, where every person can create the future they wish to inhabit. How is StartSomeGood different from other crowdfunding sites? We focus on social change organizations. The biggest existing crowdfunding platforms, Kickstarter in the US and FundBreak in Australia, are exclusive to creative projects. We want to provide this same functionality to social entrepreneurs working to address poverty, crime, climate change and more. Blended-risk fundraising model. Kickstarter and FundBreak both use the all-or-nothing fundraising model. This makes perfect sense of creative projects, many of which have specific fundraising tipping points (enough money to print the book, finish the film, go on tour, etc). IndieGoGo allows you to keep whatever you raise, regardless of how you did against your stated goal. StartSomeGood will have a blended model, whereby an initial amount is all-or-nothing, depending on the specific tipping point of that project/organization, but there is also a best-case goal beyond that, which they can keep any funds raised towards. This allows the individual entrepreneur to set their own level of risk/reward, as it should be. StartSomeGood is based around both organizations and projects. Social change organizations can maintain permanent profiles fueled by dynamic feeds, aggregating and building their community of supporters across multiple fundraising campaigns. The StartSomeGood platform will allow for not only financial contributions but other forms of probono support needed by social entrepreneurs. Do you think this sounds exciting? Do you want to help? Great! Support our fundraiser on IndieGoGo – we are currently fundraising on another crowdfunding platform, IndieGoGo, and would love your support. You get half of your contribution back in the form of a voucher to pay forward to a social good organization on our site when it goes live. So you'll not only be supporting the launch of our new social enterprise but another beyond that! The remaining funds will support our outreach and promotion around the launch (including competitions to give away more vouchers, most of it will ultimately flow directly to the enterprises launching on our site), hosting costs, etc. This modest amount of start-up funding is important to allowing us to launch effectively, and having pre-committed funds ready to support new enterprises is critical to building early momentum when we launch. Please contribute. Help us find great ventures – task 1 for us is to find inspiring initiatives to help launch. We have several really exciting groups lined up for the launch but are looking for more. If you know of a great social change initiative looking to launch in the next six months please put them in touch. Become a StartSomeGood Mobilizer – we are recruiting a team of Mobilizers to help get the word out, people who are passionate about social change and innovation, enjoy meeting new people and talking up new things. I am so thrilled with the caliber of people who have agreed to get involved, thank you friends! But there are gaps in our network so if this sounds like you or someone you know I’d love to hear from you, especially if you are in Perth, Adelaide, Toronto, Vancouver, Seattle, Portland, Chicago, Denver, Boston, Philadelphia, or Pittsburgh. Stay in the loop – if you would like to be the first to know when the site goes live please sign up for our newsletter at www.StartSomeGood.com. I'm very excited to be commencing on this journey. I think there's a real opportunity to create something sustainable of real value, and to learn a lot along the way. I look forward to your support and collaboration and to starting some good in 2011! Over the past couple of weeks two interesting and inter-related controversies have sprung up which reveal in stark terms Apple's lack of support for non-profits and values as a corporate citizen. Beth Kanter, the nonprofit web guru, started drawing attention a couple of weeks ago to the iPhone's lack of support for donation apps.The essense of the issue is that apps cannot process donations natively. The best they can do is link to a charities website for people to make donations. This is clearly a more complicated process and we know that every addition step required to make a donation loses a significant proportion of your potential donors. Following the earthquake in Haiti Apple itself requested donations through an iPhone app, raising hopes of a change of policy which has not been forthcoming. Earlier this year Paypal introduced the option to make a charitable donation through their iPhone app, with verification handled by an outside company MissionFish. Two months later they were forced by Apple to shut it down. One possible issue may be that Apple takes 30% of revenue from the app store, an proportion way beyond what is considered acceptable for donation processing. This is all pretty annoying in its own right, and you should certainly support the petition currently being run on Care2 asking Apple to rescind this policy, but just how galling it is was brought home to me by another news item last week. A group of parents are crying foul after being hit with unexpected bills from their children playing games on the iPhone and iPad. The games, such as Smurf Village, are clearly designed for kids, allow you to skip over the hardest stages of the game by purchasing, for real money, in-game items such as Smurfberries. It is even possible to purchase a whopping $59.99 worth of Smurfberries in just two clicks. Other kids games sells virtual items for up to $100. One reason for this is that you only need to log into your iTunes account every 15 minutes to make purchases. So if a parent buys this game then immediately hands the device to their child there's a window in which new purchases can be made without any need to re-enter account information. However several parents are reporting that they carefully waited for the required amount of time before allowing their child to play and still ended up with a nasty surprise when they saw their bill. So on the one hand we have a situation where it's impermissible to make an in-application donation to a nonprofit organization doing good in the world, while on the other it's so easy to spend money inside an application that it's literally child’s play. 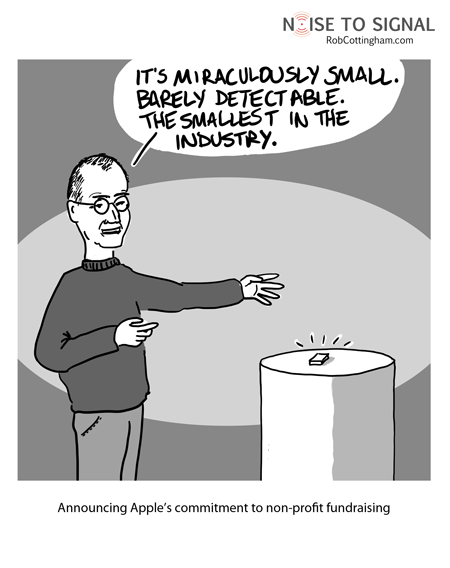 There's no possible justification for this hypocrisy, and continues a trend of Apple disregarding the nonprofit sector. When I approach Apple for sponsorship when running Vibewire about five years ago I was told that Apple had a corporate policy of not supporting nonprofits or making any donations. Their job was the maximize profits, and shareholders could decide how to disburse those profits. So perfect right-wing corporatism in other words. And, indeed, they have been named one of America's least philanthropic companies. To me this issue shows without any doubt Apple's true corporate culture. To the extent that they have involved themselves with nonprofits or made positive moves like decreasing the environmental impact of their devices, this can only be seen as cause marketing, something they felt they needed to do for their brand and sales, not something driven by a belief that business has any role beyond profit maximisation. They sure do make pretty things though. Sign the petition asking Apple to allow donations within their apps.